St. Andrew’s Episcopal School is pleased to offer a variety of giving opportunities for you to support the mission and activities of the school. St. Andrew’s Episcopal School accepts gifts of cash, check, and credit card. CLICK HERE for details on how to submit your generous gift. Consider doubling the impact of your gift! Many companies offer matching gift programs that can double or even triple the value of your gift. Just check with your employer for employer-sponsored matching gift programs. Publicly traded securities are the most common form of non-cash charitable gift asset. The most favorable tax treatment is generated by gifts of appreciated, long-term, capital-gain securities. Generally, the value of your charitable deduction will be equal to the average of the highest and lowest selling prices of the stock on the date the gift is completed. For purposes of calculating your charitable deduction for gifts of stock, you should contact your tax or financial advisor. Gifts-in-kind are “non-cash” donations of materials or items and are always welcomed. 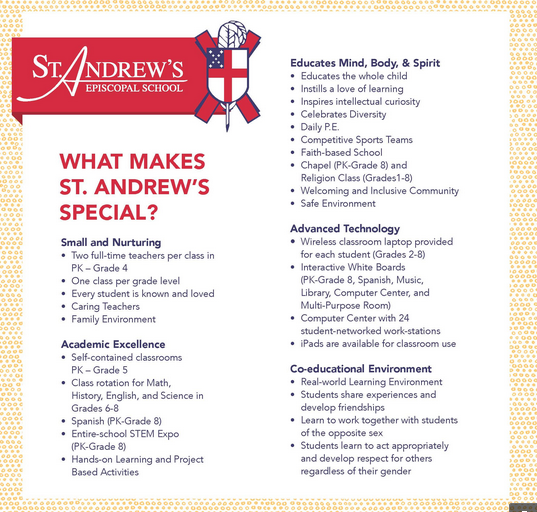 Please contact Dominique Chauvin, Director of Development at (504) 866-6552 or dchauvin@standrewsepiscopalschool.org if you are interested in making a donation to St. Andrew’s Episcopal School.